Completely updated throughout—and still the only reference of its kind—the new edition of this well-respected resource offers you a practical guide for the evaluation, diagnosis, and management of a full range of common and uncommon obstetric and gynecologic skin disorders. Expanded coverage—including chapters on vulval vaginal disease help you meet more clinical challenges, while more than 460 illustrations emphasize pathologic and clinical appearances of dermatologic problems, providing essential visual guidance for the most informed diagnoses. Enhanced basic dermatologic information, such as general introductions to treatment, treatment options, and rashes, makes this an excellent guide for dermatologist and non-dermatologists, as well as obstetricians and gynecologists. A CD-ROM—new to this edition—provides convenient access to all of the book’s images for your personal use. Features the contributions of a team of international experts who provide a global perspective on today’s best practices. 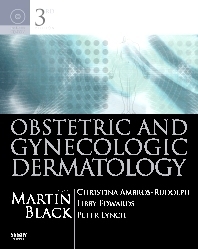 Provides exceptional visual guidance of both obstetric and gynecologic dermatoses, making this a convenient one-stop consultation reference. Includes more than 460 illustrations that clarify the key features of diseases and provide a greater “true-life” practice perspective for making accurate diagnoses. Covers a full spectrum of conditions, including vulvar dermatoses, dermatoses of pregnancy, effect of pregnancy on other skin disorders, and more, to help you meet a full range of clinical challenges for diverse patient populations. "The CD Rom included provides convenient delivery of the information. The book is an excellent reference guide for any O&G or dermatologist and is a particularly good text for those trainees embarking on a career in this subspecialty... Concise yet informative with exceptional illustrations. New information and updates are delivered simply but informatively."